The Suzuki M109 and VZR 1800 motorcycles are both kings in their own right, but it doesn't take an expensive saddlebag to perfectly compliment these classic beauties. Our online collection of luggage solutions from Viking Bags should serve every type of want and need imaginable. There's truly a bag for every individual, and we'll help you find it! Step inside to see more details about each of these saddlebags, or give us a call to learn more. We're so confident you'll absolutely love your Viking Bags for your Suzuki bike, we're providing a 30-day money back guarantee with every purchase. 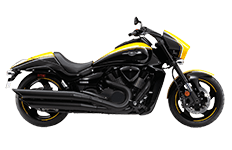 Each sale also comes with free mounting hardware and installation instructions, giving you the ability to install these saddlebags right out of the box. Test them out, see how you like them and load them up with your favorite items!